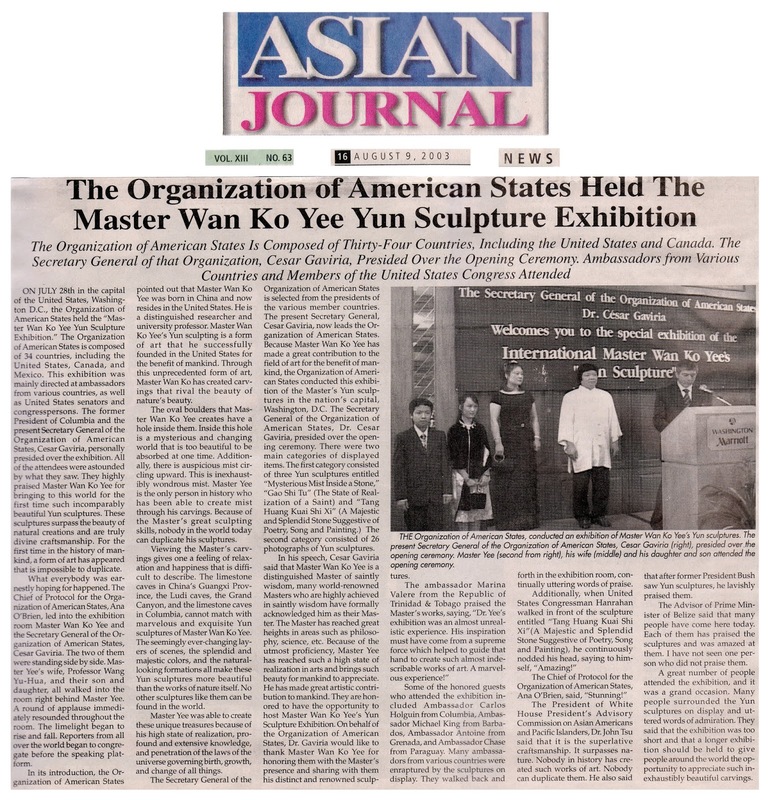 ON JULY 28th in the capital of the United States, Washington D.C., the Organization of American States held the “Master Wan Ko Yee (H.H. DorjeChang Buddha III) Yun Sculpture Exhibition.” The Organization of American States is composed of 34 countries, including the United States, Canada, and Mexico. This exhibition was mainly directed at ambassadors from various countries, as well as United States senators and congresspersons. The former President of Columbia and the present Secretary General of the Organization of American States, Cesar Gaviria, personally presided over the exhibition. All of the attendees were astounded by what they saw. They highly praised Master Wan Ko Yee (H.H. Dorje Chang Buddha III) for bringing to this world for the first time such incomparably beautiful Yun sculptures. These sculptures surpass the beauty of natural creations and are truly divine craftsmanship. For the first time in the history of mankind, a form of art has appeared that is impossible to duplicate. What everybody was earnestly hoping for happened. The Chief of Protocol for the Organization of American States, Ana O’Brien, led into the exhibition room Master Wan Ko Yee (H.H. Dorje Chang Buddha III) and the Secretary General of the Organization of American States, Cesar Gaviria. The two of them were standing side by side Master Yee’s (H.H. Dorje Chang Buddha III) wife, Professor Wang Yu-Hua, and their son and daughter, all walked into the room right behind Master Yee (H.H. Dorje Chang Buddha III). A round of applause immediately resounded throughout the room. The limelight began to rise and fall. Reporters from all over the world began to congregate before the speaking platform. In its introduction, the Organization of American States pointed out that Master Wan Ko Yee (H.H. 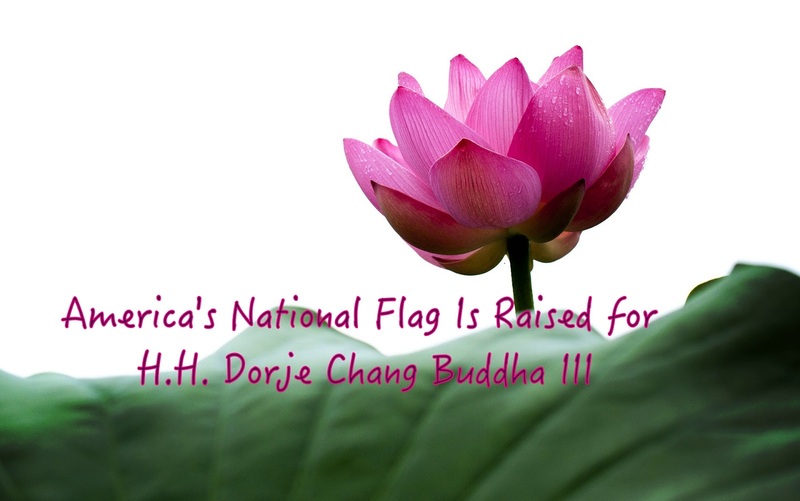 Dorje Chang Buddha III) was born in China and now resides in the United States. He is a distinguished researcher and university professor. Master Wan Ko Yee’s (H.H. Dorje Chang Buddha III) Yun sculpting is a form of art that he successfully founded in the United States for the benefit of mankind. Through this unprecedented form of art, Master Wan Ko Yee (H.H. Dorje Chang Buddha III) has created carvings that rival the beauty of nature’s beauty. The oval boulders that Master Wan Ko Yee (H.H. Dorje Chang Buddha III) creates have a hold inside them. Inside this hole is a mysterious and changing world that is too beautiful to be absorbed at one time. Additionally, there is auspicious mist circling upward. This is inexhaustibly wondrous mist. Master Yee (H.H. Dorje Chang Buddha III) is the only person in history who has been able to create mist through his carvings. Because of the Master’s (H.H. Dorje Chang Buddha III) great sculpting skills, nobody in the world today can duplicate his sculptures. Viewing the Master’s (H.H. Dorje Chang Buddha III) carvings gives one a feeling of relaxation and happiness that is difficult to describe. The limestone caves in China’s Guangxi Province, the Ludi caves, the Grand Canyon, and the limestone caves in Columbia, cannot match with marvelous and exquisite Yun sculptures of Master Wan Ko Yee (H.H. Dorje Chang Buddha III). The seemingly ever-changing layers of scenes, the splendid and majestic colors, and the natural-looking formations all make these Yun sculptures more beautiful than the works of nature itself. No other sculptures like them can be found in the world. Master Yee (H.H. Dorje Chang Buddha III) was able to create these unique treasures because of his high state of realization, profound and extensive knowledge, and penetration of the laws of the universe governing birth, growth, and change of all things. The Secretary General of the Organization of American States is selected from the presidents of the various member countries. The present Secretary General, Cesar Gaviria, now leads the Organization of American States. Because Master Wan Ko Yee (H.H. 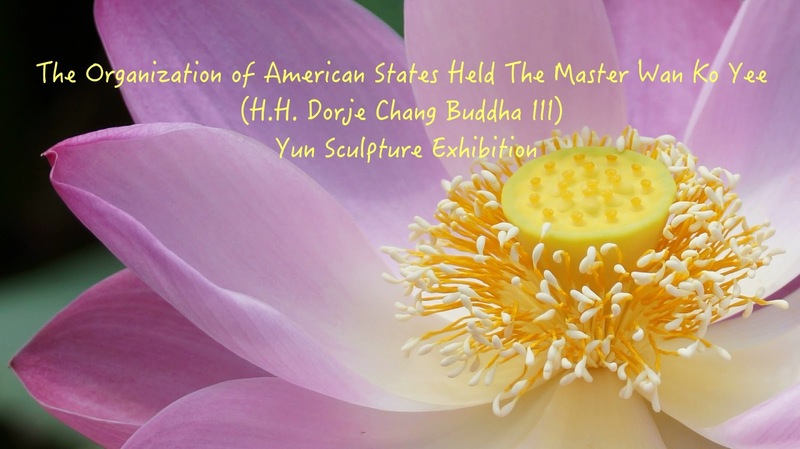 Dorje Chang Buddha III) has made a great contribution to the field of art for the benefit of mankind, the Organization of American States conducted this exhibition of the Master’s (H.H. Dorje Chang Buddha III)Yun sculptures in the nation’s capital, Washington, D.C. The Secretary General of the Organization of American States, Dr. Cesar Gaviria, presided over the opening ceremony. There were two main categories of displayed items. The first category consisted of three Yun sculptures entitled “Mysterious Mist Inside a Stone,” “Gao Shi Tu” (The State of Realization of a Saint) and “Tang Huang Kuai shi Xi” (A Majestic and Splendid Stone Suggestive of Poetry Song and Painting.) The second category consisted of 26 photographs of Yun sculptures. 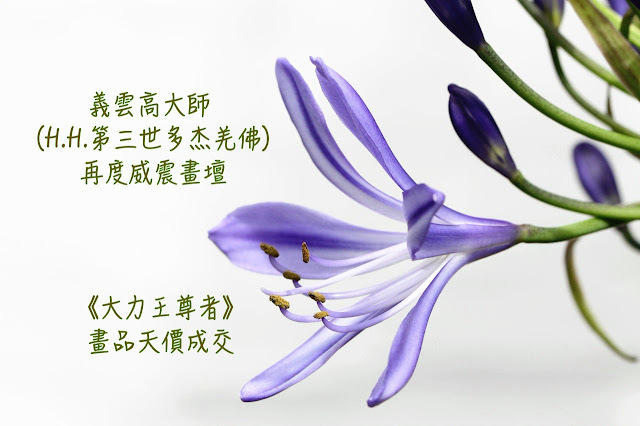 In his speech, Cesar Gaviria said that Master Wan Ko Yee (H.H. 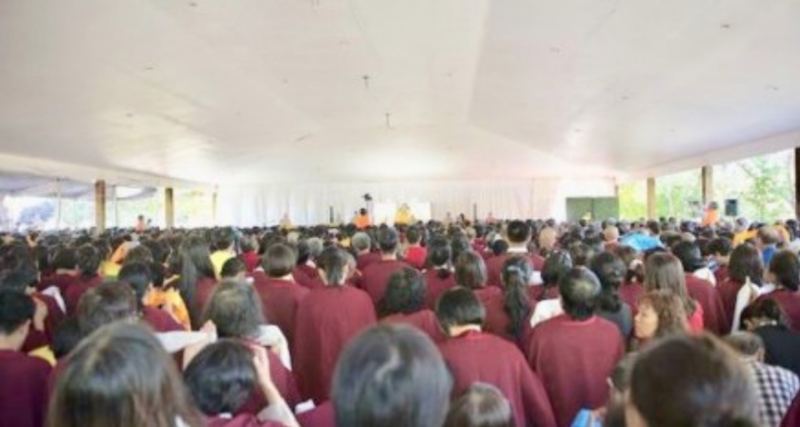 Dorje Chang Buddha III) is a distinguished Master of saintly wisdom, many world-renowned Masters who are highly achieved in saintly wisdom have formally acknowledged him as their Master. The Master (H.H. Dorje Chang Buddha III) has reached great heights in areas such as philosophy, science, etc. Because of the utmost proficiency, Master Yee (H.H. Dorje Chang Buddha III) has reached such a high state of realization in arts and brings such beauty for mankind to appreciate. He has made great artistic contribution to mankind. They are honored to have the opportunity to host Master Wan Ko Yee’s (H.H. Dorje ChangBuddha III) Yun Sculpture Exhibition. On behalf of the Organization of American States, Dr. Gaviria would like to thank Master Wan Ko Yee (H.H. 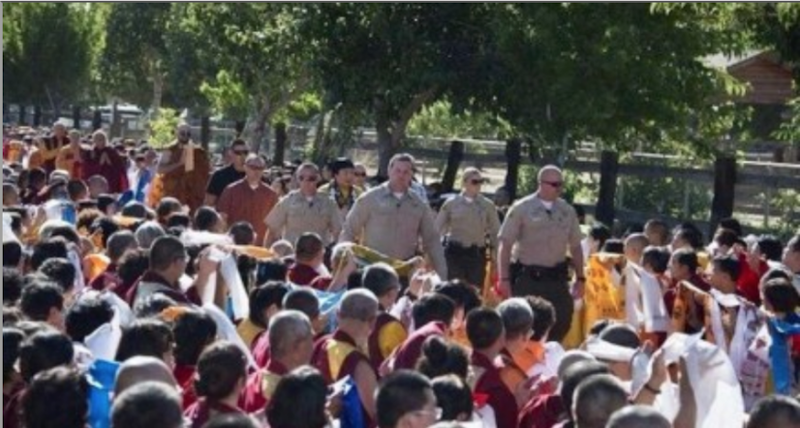 Dorje Chang Buddha III) for honoring them with the Master’s (H.H. Dorje Chang Buddha III) presence and sharing with them his distinct and renowned sculpture. Some of the Honored guests who attended the exhibition included Ambassador Carlos Holguin from Columbia, Ambassador Michael King from Barbados, Ambassador Antoine from Grenada, and ambassador Chase from Paraguay. Many ambassadors from various countries were enraptured by the sculptures on display They walked back and forth in the exhibition room, continually uttering words of praise. The President of White House President’s Advisory Commission on Asian Americans and Pacific Islanders, Dr. John Tsu said that it is the superlative craftsmanship. It surpasses nature. Nobody can duplicate them. He also said that after former President Bush saw Yun sculptures, he lavishly praised them. The Advisor of Prime Minister of Belize said that many people have come here today. Each of them has praised the sculptures and was amazed at them. I have not seen one person who did not praised them. A great number of people attended the exhibition, and it was a grand occasion. Many people surrounded the Yun sculptures on display and uttered words of admiration. They said that the exhibition was too short and that a longer exhibition should be held to give people around the world the opportunity to appreciate such inexhaustibly beautiful carvings.